New technology that harnesses electronic signals in a smart fabric could lead to advanced hazardous-material gear that protects against toxic chemicals, according to research from Dartmouth College. The advancement could have big implications for the military, emergency service personnel and other workers that rely on "haz-mat" protection to perform their work and keep others safe. In research published in the Journal of the American Chemical Society, the chemistry team of Katherine Mirica and Merry Smith describe the creation of new smart fabrics—named SOFT, for Self-Organized Framework on Textiles—in what is noted as the first demonstration of simultaneous detection, capture, pre-concentration and filtration of gases in a wearable that uses conductive, porous materials integrated into soft textiles. According to the study, the SOFT devices have the potential for use in sensing applications ranging from real-time gas detection in wearable systems, to electronically accessible adsorbent layers in protective equipment like gas masks. "By adding this fabric to a protective suit, sensors can alert the user if a chemical is penetrating the hazardous-material gear," said Katherine Mirica, an assistant professor of chemistry at Dartmouth College. "This is not just passive protection, the textile can actively alarm a user if there is a tear or defect in the fabric, or if functional performance is diminished in any other way." Among other firsts described in the research are flexible, textile-supported electronic sensors based on materials known as metal-organic frameworks, or MOFs. In the study, the authors also describe a "simple" approach for integrating these conductive, porous materials into cotton and polyester fabrics to produce the e-textiles. As part of the study, the Dartmouth team demonstrated that the new smart fabric can detect common toxic chemicals. Both the vehicle exhaust pollutant, nitric oxide, and the corrosive poison that reminds most of rotten eggs, hydrogen sulfide, were effectively identified by the SOFT system. In addition to sensing the chemicals, the electronic textiles are capable of capturing and filtering the dangerous toxins. "Metal-organic frameworks are the future of designer materials, just like plastics were in the post-WWII era," said Mirica. 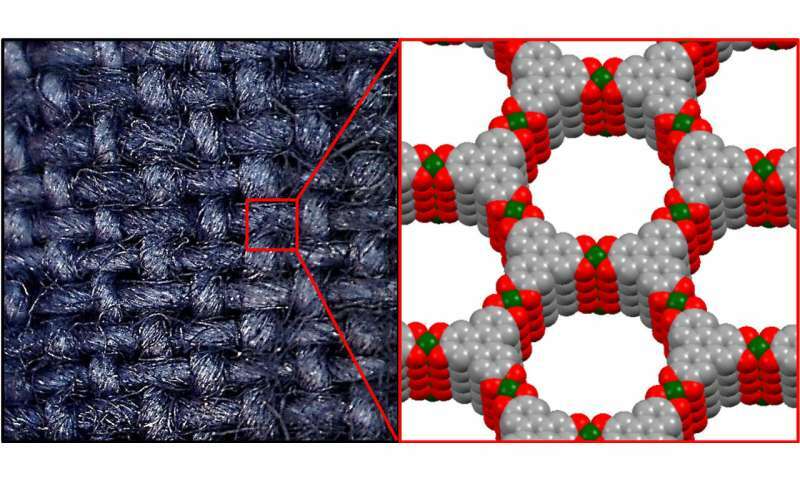 "By integrating the MOFs into our SOFT devices, we dramatically enhance the performance of smart fabrics that are essential to safety and security." The research team also describes a one-step e-textile fabrication method based on MOFs that likely constitutes the first use of direct self-assembly to deposit the conductive material on textiles. In a process that Mirica describes as "similar to a building framework assembling itself," cotton and polyester textiles coated with conductive crystals at the fiber-level are created by direct self-assembly of molecules with organic molecular struts connected by metallic linkers from solution. Wearable electronics are thought to have great potential in areas including homeland security, communication and healthcare. Soldiers, emergency personnel, factory workers and others that risk exposure to toxic chemicals could benefit from the new smart fabrics. The materials could also help medical patients that require monitoring of specific airborne chemicals that come from the environment or even from their own bodies. According to researchers, the SOFT devices featuring MOFs display reliable conductivity, enhanced porosity, flexibility and stability to washing. The fabrics are also stable in heat, have good shelf-lives and retain a full-range of utility under humid conditions. While the technology requires further development before it can be used in state-of-the-art wearable systems, the authors are hopeful that the fabrication method has the potential to be extended into other systems, producing a range of novel, multifunctional e-textiles with highly tunable properties and a host of new applications in wearable and portable devices.